When choosing a villa, there are two main areas we love: Orient and Terres Basses. The Orient is fun, young and hip with a French flair. You’ll find lots of beach bars -- and in some spots, little swimwear -- along famous Orient Beach. Terres Basses is a gated community with its own private beach. It’s considered the high-end part of the island, and you’ll notice it feels more mature and luxurious. It's more old-school French than the Orient area, but still close to all the nightlife of Simpson Bay. With a little help from WhereToStay.com, we’ve compiled a list of the very best villas St. Martin has to offer. Topaz Villa is situated on a hillside where the views of Orient Bay beach are stunning. This chic, contemporary island home has an indoor gym, and the main living area has sliding glass doors that open up onto a fabulous deck with plunge pool and unique furniture that glows in the dark -- a great choice for the young, hip and active! Pearl Villa is a newly constructed home with stunning views of Orient Bay and the Atlantic Ocean. It has been impeccably furnished in a clean, modern style, offering an airy and open feel. This villa features a comfortable living room that opens onto a covered patio and large pool, where the fiber-optic-lights make each night an illuminating experience. Bali Villa is the perfect Terres Basses pick for couples or families with older children. The home was recently renovated, so everything is new, stylish, and comfortable. The pool on the patio is surrounded by tropical plants, so it's very private. If you prefer to swim or snorkel in the ocean, Plum Bay Beach is just 3 minutes away by car. Turtle Nest Villa is a tropical paradise with lavish, contemporary style. This villa has a gorgeous shimmering blue pool and generous terrace. 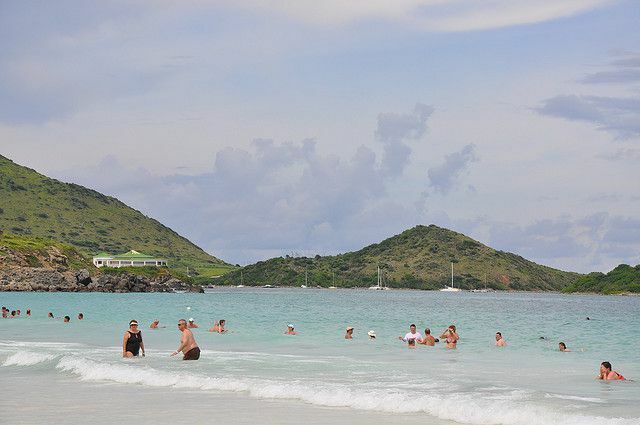 It's the ultimate St. Martin spot for a large family or group getaway. Kiwi Villa is very light and open and designed for easy indoor/outdoor living. The bedrooms each have private bathrooms, two of which are partially outdoors. The deck outside is huge and features a private pool, roomy gazebo, and plenty of seating. A 5-minute car ride will take you to three different beaches where you can swim and snorkel, and groceries, shops, and restaurants are just 10 minutes away. We recommend Bamboo Villa for two couples, honeymooners, or a small family. A large living area is the perfect place to unwind in the evening. Or take your party outside on the patio and enjoy the view of the Caribbean Sea and surrounding tropical garden. A huge pool is great for day or night swims. The gorgeous 360-degree views of La Samanna and Plum Bay Beach seen from the upper deck at Just in Paradise Villa make vacations here memorable. Another perk: Just in Paradise Villa has one of the largest open pool decks in St. Martin, as well as a rooftop bar and lounge. It’s an ideal place to host a beach house gathering. Casa Cervo is a four-bedroom, beachfront villa with a pool and gazebo that form a focal point for outdoor living at its best. Located on a very secluded stretch of Baie Rouge Beach, this casual but sprawling home is just steps away from white sand and cool water. With a unique blend of modern luxury and classic beauty, C'est La Vie Villa is the perfect beachfront home for a group looking to get away together. This luxurious six-bedroom villa opens onto an expansive deck area featuring a heated pool, Jacuzzi and a pool bar. The many hammocks and lounge chairs invite guests to linger and relax.